March 22, 2012 | David S. Maldow, Esq. Video startup Blue Jeans Network announced today that their acclaimed cloud-based video bridging / interoperability service will now be available for a fixed monthly fee, as an option to the currently available per minute pricing. Telepresence Options was briefed by Stu Aaron (above right) and James Matheson (above left) this morning for some background on this announcement. The briefing was held using the Blue Jeans service and included Skype with H.323 endpoints, and standard telephone connections. While this announcement may appear at first to be a mere pricing option, in effect it changes the nature of the offering entirely. 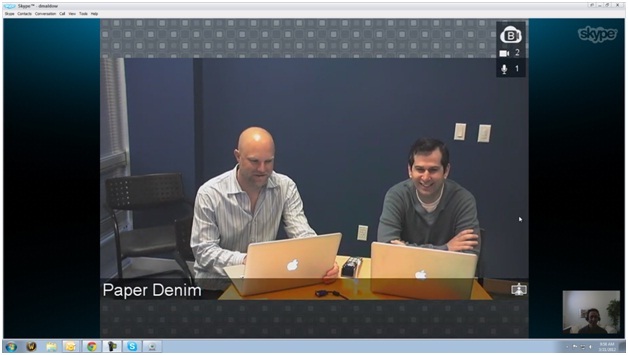 Previously, Blue Jeans was focused on creating a video version of a typical audio conferencing tool. As such, the primary focus was on interoperability, which is the Blue Jeans claim to fame. 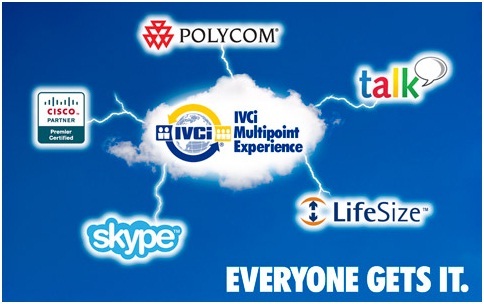 Offering the ability to easily connect traditional videoconferencing endpoints, Skype, and even MS Lync has established Blue Jeans as a pioneer in the B2C (Business to Consumer) videoconferencing field. Enterprises, and even managed service providers such as IVCi, are already leveraging Blue Jeans to solve their B2C and interop issues. Despite the success of Blue Jeans among technology critics and in the marketplace, their pricing model did tend to raise questions from the videoconferencing community. Blue Jeans, built as a video alternative to audio conferencing, naturally followed a pay-per-use audio conferencing model. The video community struggled to compare the Blue Jeans offering to traditional bridging services and failed, because Blue Jeans was selling interoperability, not bridging. However, no one seemed to have told the customers, many of whom have quickly adopted Blue Jeans as their primary bridging solution. "We looked at options for purchasing hardware MCU equipment, and even our vendor reluctantly agreed that they made little business sense for us. On top of the tremendous capital cost, there was significant cost to deploy, operate, and support the equipment internally. We didn't want to waste time and money building a video platform; we wanted to start communicating. With Blue Jeans, we receive all the features available in a hardware-based MCU, plus interoperability with Skype, Lync, iPad, and iPhone endpoints, and the assurance that we have access to a platform that's going to continue to keep up with growth and change. We started making calls through Blue Jeans on day one, and we are using the service more often than we had expected." - John Laur, IT Director, EnergyNet.com, Inc.
Customers clearly want Blue Jeans as a bridging alternative, but they are used to paying by the port (or per connection), not by the minute, for video bridging. With port based pricing ($300 per endpoint per month) users can now price out their Blue Jeans service as an alternative to purchasing a traditional MCU or using the services of an MSP. Traditional MCUs can be expensive, difficult to manage, and hard to scale. Many enterprises are switching to managed service providers, but this is really just transferring the limitations and headaches of MCU ownership from the end user to the MSP. The industry is well aware that the future is in cloud-based virtualized bridging. It is easier to develop and update virtual bridges that aren't bound by the constraints of their custom hardware, and it is easier to scale a virtual based offering (i.e. customers would rather buy additional licenses than buy additional MCUs). The writing on the wall is so clear that even the traditional MCU vendors are announcing their own MCU killing virtualized solutions. However, with the infrastructure market at about $700 million a year, MCUs are not dead yet. As Stu explained, the industry is going through the four phases of technology disruption. Roughly paraphrasing Stu, the phases are as follows. Denial - "Hardware is the only way to do enterprise video. This Cloud stuff won't work." F.U.D. - "Maybe someday this cloud stuff will work, but you don't want to risk doing business with a startup, stick with our tried and true hardware." Market Catch Up - "We think Cloud is great. We are working on our own solution." Acceptance - "It is too late to catch up. Let's take a look at partnering with that disruptive startup." Blue Jeans believes that the industry is in phase three and the next phase is inevitable. The advantages of virtualized bridging are just too compelling to ignore. While Blue Jeans isn't the only innovative force behind virtualized bridging today, they are one of the few with a field tested solution and industry leading interoperability. As a result, they are certainly being closely watched by the old school video industry heavyweights. Blue Jeans has tested the new "MCU Killer" pricing plan with about a dozen customers and says the feedback has been amazing. In particular, small and midsize enterprises that were considering their first MCU, but were priced out of the game, found this to be a great way to get in the game and start enjoying the benefits of video conferencing. The Blue Jeans combination offers a competitive pricing, industry leading interop, excellent ease of use, and an extremely fast path to enabling video communications in almost any environment. http://bluejeans.com/mcu. 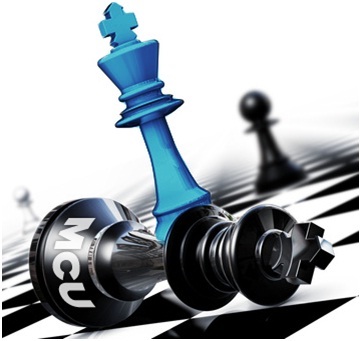 By offering their service as an "MCU Killer" they are absolutely creating new options for end users and potentially creating some serious disruption in the industry. David Maldow is a visual collaboration technologist and analyst with the Human Productivity Lab and an associate editor at Telepresence Options. David has extensive expertise in testing, evaluating, and explaining telepresence and other visual collaboration technologies. David is focused on providing third-party independent testing of telepresence and visual collaboration endpoints and infrastructure and helps end users better secure their telepresence, videoconferencing, and visual collaboration environments. You can follow David on Twitter and Google+. \"We looked at options for purchasing hardware MCU equipment, and even our vendor reluctantly agreed that they made little business sense for us. On top of the tremendous capital cost, there was significant cost to deploy, operate, and support the equipment internally. We didn't want to waste time and money building a video platform; we wanted to start communicating. With Blue Jeans, we receive all the features available in a hardware-based MCU, plus interoperability with Skype, Lync, iPad, and iPhone endpoints, and the assurance that we have access to a platform that's going to continue to keep up with growth and change. We started making calls through Blue Jeans on day one, and we are using the service more often than we had expected.\" - John Laur, IT Director, EnergyNet.com, Inc.
Customers clearly want Blue Jeans as a bridging alternative, but they are used to paying by the port (or per connection), not by the minute, for video bridging. With port based pricing (\$300 per endpoint per month) users can now price out their Blue Jeans service as an alternative to purchasing a traditional MCU or using the services of an MSP. Traditional MCUs can be expensive, difficult to manage, and hard to scale. Many enterprises are switching to managed service providers, but this is really just transferring the limitations and headaches of MCU ownership from the end user to the MSP. The industry is well aware that the future is in cloud-based virtualized bridging. It is easier to develop and update virtual bridges that aren't bound by the constraints of their custom hardware, and it is easier to scale a virtual based offering (i.e. customers would rather buy additional licenses than buy additional MCUs). The writing on the wall is so clear that even the traditional MCU vendors are announcing their own MCU killing virtualized solutions. However, with the infrastructure market at about \$700 million a year, MCUs are not dead yet. As Stu explained, the industry is going through the four phases of technology disruption. Roughly paraphrasing Stu, the phases are as follows. Denial - \"Hardware is the only way to do enterprise video. This Cloud stuff won't work.\"
F.U.D. - \"Maybe someday this cloud stuff will work, but you don't want to risk doing business with a startup, stick with our tried and true hardware.\"
Market Catch Up - \"We think Cloud is great. We are working on our own solution.\"
Acceptance - \"It is too late to catch up. Let's take a look at partnering with that disruptive startup.\"
Blue Jeans has tested the new \"MCU Killer\" pricing plan with about a dozen customers and says the feedback has been amazing. 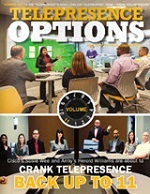 In particular, small and midsize enterprises that were considering their first MCU, but were priced out of the game, found this to be a great way to get in the game and start enjoying the benefits of video conferencing. The Blue Jeans combination offers a competitive pricing, industry leading interop, excellent ease of use, and an extremely fast path to enabling video communications in almost any environment. http://bluejeans.com/mcu. By offering their service as an \"MCU Killer\" they are absolutely creating new options for end users and potentially creating some serious disruption in the industry. David Maldow is a visual collaboration technologist and analyst with the Human Productivity Lab and an associate editor at Telepresence Options.\n David has extensive expertise in testing, evaluating, and explaining \ntelepresence and other visual collaboration technologies. 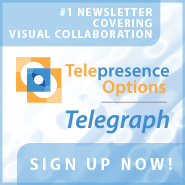 David is \nfocused on providing third-party independent testing of telepresence and\n visual collaboration endpoints and infrastructure and helps end users \nbetter secure their telepresence, videoconferencing, and visual \ncollaboration environments. You can follow David on Twitter and Google+.